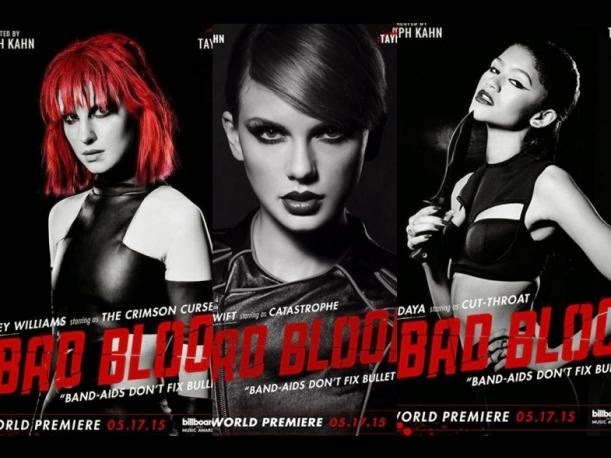 As a prelude to the launch of the Taylor Swift’s new music video, the list of personalities / celebrities who will participate in "Bad Blood" video was released. Through social networks, the singer Taylor Swift has announced her appearance at the Billboard Music Awards on 17 May. She also shared the image of her new single 'Bad Blood' which she performs live during the ceremony. The video was directed by Joseph Kahn, who announced that include multiple characters, played by a cast of awards winners such as the Golden Globe, Emmy, Grammy and Oscar nominees. The simple part of her success in album '1989', which has placed at the top of the charts and sales, thanks to songs like "Shake It Off ',' Blank Space 'and' Style '. The musical event that recognizes the best of the commercial industry will feature numerous pop figures such as Britney Spears and Iggy Azalea (who sing a song together), Sam Smith, Kelly Clarkson, Ed Sheeran, Meghan Trainor, John Legend, Fall Out Boy with Wiz Khalifa, Hozier and Nick Jonas. Here is the list of personalities who will participate in the Taylor Swift’s new video.